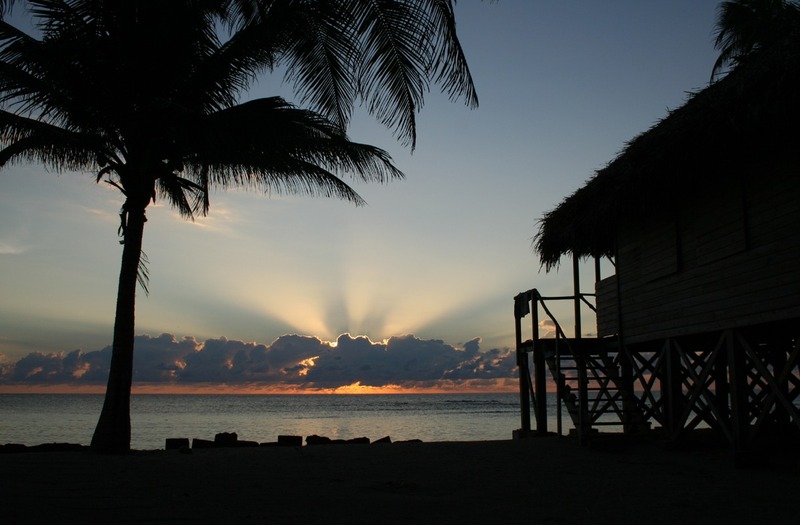 VRBO Belize stands for “vacation rentals by owner”. Have you ever thought of renting a whole island? Adventure Island is the ultimate Belize all-inclusive family resort. We would love to rent you our island for your reunion, wedding, or group. We can help you plan your entire adventure vacation. Our island is extremely remote and unique, not only in Belize but in the Caribbean. For the adventurous group, ours is the perfect place for a group of friends or family to book 6 or 9 nights right on the ocean with the best cabana view you have ever seen. Our Adventure Island package is one of the best adventure vacation deals in Belize, because everything is included. First and foremost, Long Caye is truly a private island. There is no one there but us and the dive shop. 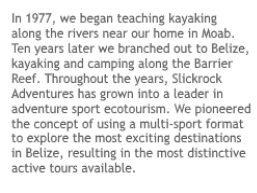 The entire Slickrock facility would be yours. This is unheard of in the Caribbean. Second, our island is as undeveloped as possible. If you come from a camping background, you would consider it cushy, but if your background and expectations are from a more traditional standpoint, you would call it ‘rustic’. This is a Belize eco-lodge. We do not have flush toilets but use ecologically friendly composting toilets (we flush nothing into the sea.) Also, there are no toilets attached to the rooms, you must walk to the toilets and showers, which are unheated. You can see our beach huts elsewhere on our site. 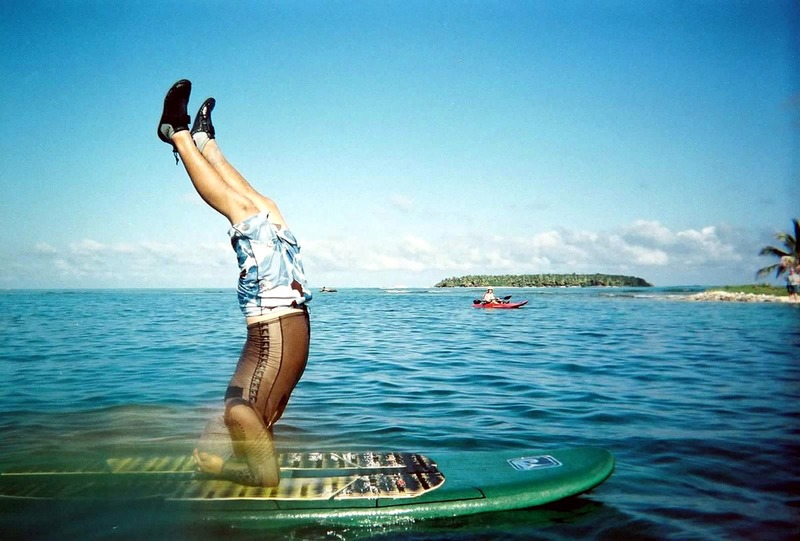 On the island, we have the most extensive offering of adventure sports in Belize. 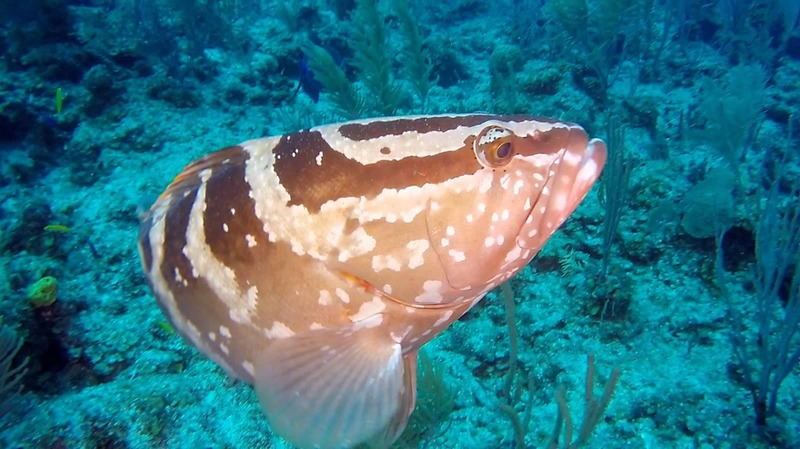 If you are looking for Belize snorkeling vacation packages, look no further! 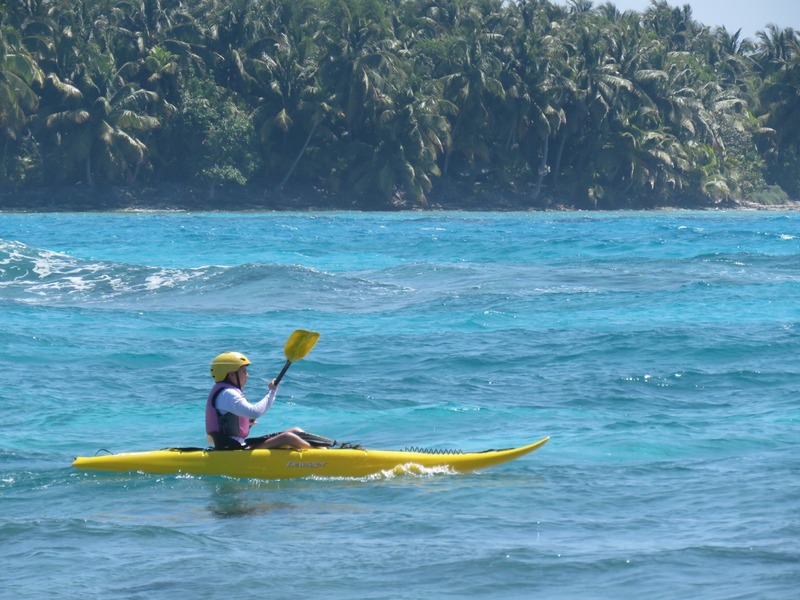 In addition to snorkeling, we guide and instruct sea kayaking, scuba diving, windsurfing, kayak surfing, Belize fly fishing, kayak fishing, paddleboarding, and board surfing (not to mention hammock surfing!) 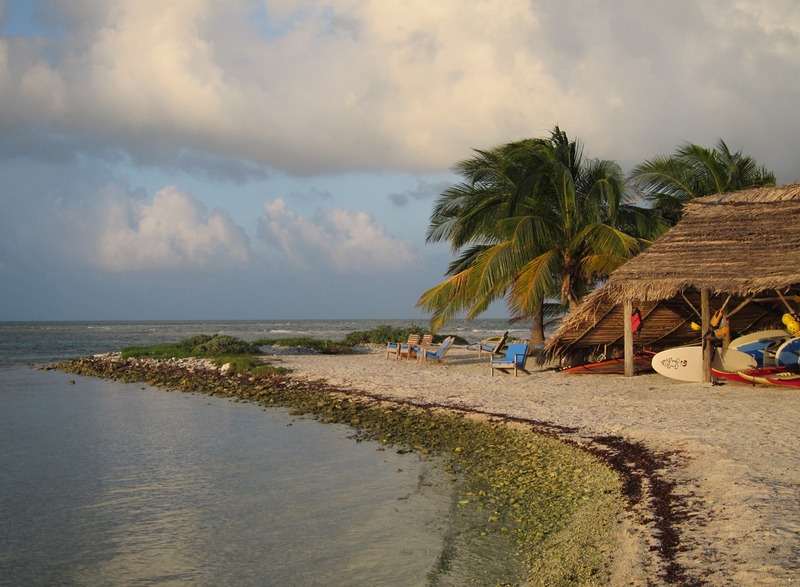 We also have the only Belize kitesurfing center at Glover’s Reef, the best location for kiteboarding in the country. Group organizers should refer to our charter policy along with our Adventure Island at Glover’s Reef trip description, the week-long package on the island. The charter policy explains the specific price breaks and other benefits and restrictions available to groups who charter the island. Please request the charter policy to be mailed or emailed to you. You are responsible for your own flight to Belize, but we are happy to help you find the best deal. The minimum number of paying guests we need for the charter price is 24. So these rates and other parameters only apply to your group if it is at least 24 people, not counting you, the group organizer. We can sleep 42 in cabanas, double (and sometimes triple) occupancy. If your group is less than 24, use the ‘group’ policy rather than the ‘charter’ policy. On most weeks another group comes out to the island on Wednesday. If you do not want this group joining your group, then you have to charter 30 guests so that we count the Belize Adventure Week trip for that week as ‘full’. If you are considering a date on either end of the season, we might allow you to charter for less than 30, please inquire. We are open early December – early May. If you wish to charter when we are closed we may open up for you depending on the time of year and size of your group. There also may be an additional charge for one of the boat rides since there is no other group to share this cost. Again, this depends on the size of group and date of charter. Please inquire. For groups of 24-34 persons, and on the Full Week package, the cost is 17.5% off of our regular rate of $2425/person, which comes to $2000.63 each. For groups larger than 34, the discount is higher, see charter policy. Children pay the same as adults, unless you don’t need to count them towards your total to reach a certain group size for a higher discount. If you wish to see the children’s rates, visit our Family Vacation page. Free spots: two free spots for 24-34 paying guests and 3 free spots for 35+ paying guests. The free spots may also be split amongst all members of the group, bringing everyone’s price per person down. However, when you charter, note that no one books individually, we accept balloon payments. This is explained in the charter policy also. This is for one week on the island, (6 full days, 2-1/2 days, 7 nights) with hotels before and after and restaurant meals before. The complete list of exactly what is included and exactly what is not included is listed on the Adventure Island at Glover’s Reef page.